I should say that happiness is being where one is and not wanting to be anywhere else. "A few weeks ago I discovered your blog...." I tepidly typed into The Ramble's contact form, unsure if I'd hear back from the inspirational blog run by world traveling writer Gigi Griffis. Imagine my surprise when a few hours later a warm, personalized response arrived in my inbox. And thus my correspondence began with the woman who describes herself as "a copywriter and content strategist traveling full-time with my freelance business, partner, and pup." 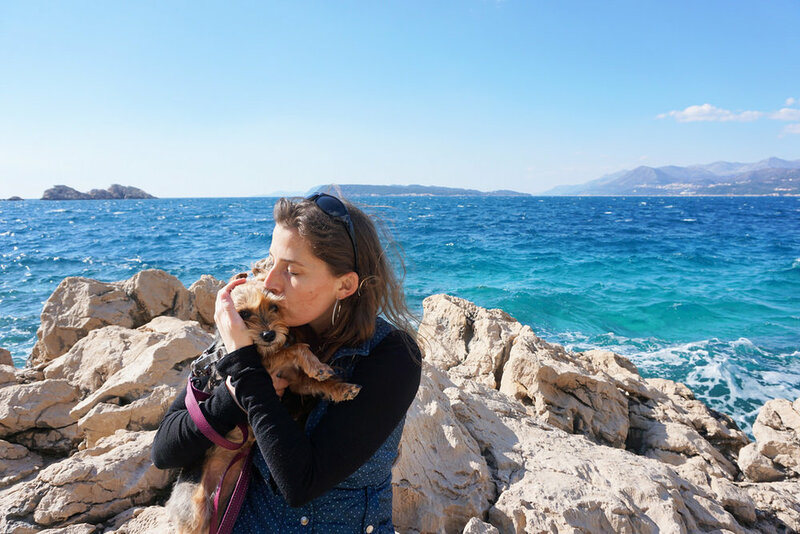 Before reaching out to Gigi, I'd stumbled across her blog as I scrambled to find information on what it was really like to travel with a dog in Europe, seeing as Mango and I unexpectedly found ourselves in Croatia after our time in Sweden came to a close. 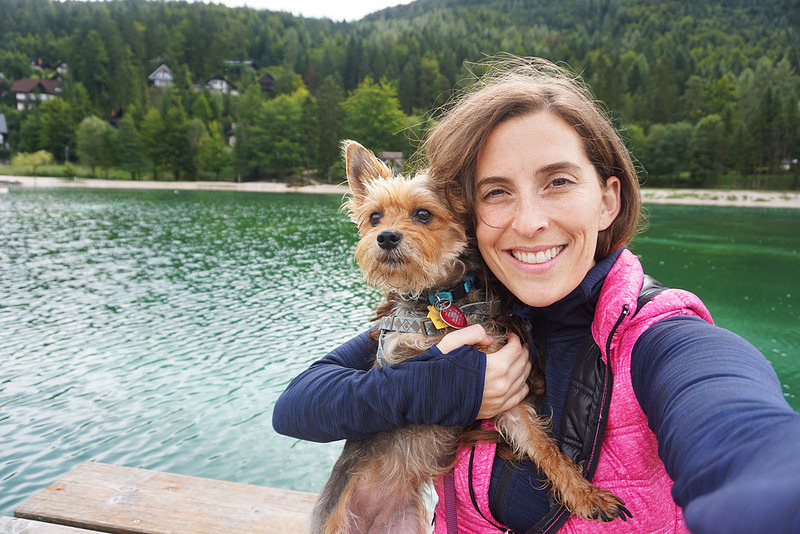 Finding The Ramble was a godsend, as Gigi's countless posts on the reality of traveling with a dog in Europe reassured me that Mango and I would land on our six feet/paws and be okay. 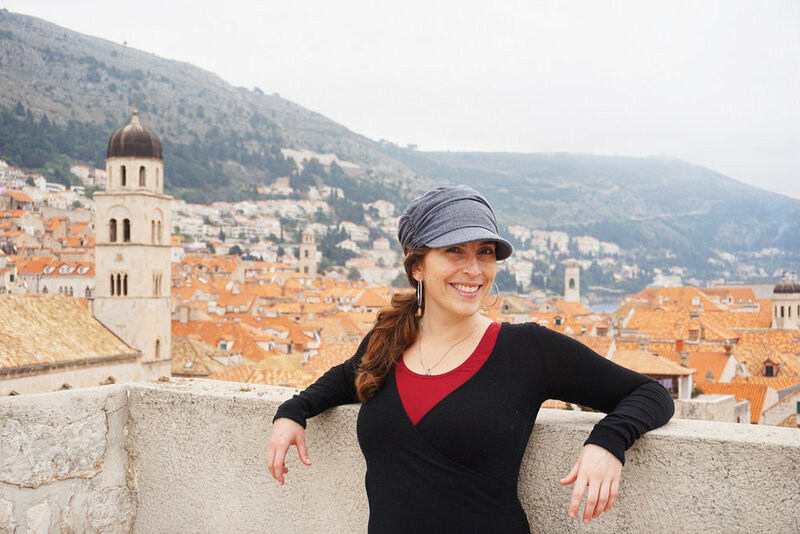 Traveling -- and living -- slowly is one of this entrepreneur's greatest life priorities and she's spent years honing how to do it best. Like I learned from my year and a half of traveling with just a carry-on suitcase and mutty sidekick, Gigi also understands the importance of carrying only things one truly needs and loves on the journey. Two unusual things you'll find in her suitcase are a folding bike (!) and spice kit, items that allow her to fully take in local sights and fresh food. But curious to know more about the places that capture Gigi's heart, I reached out to her with the handful of community-related questions below in attempt to understand what makes a place special in her eyes. And while she prefers a spectrum of settings, from over-sized cities in France and Italy with their foodie cultures to remote towns nestled in the stunning mountain ranges of Switzerland and Slovenia, one thing is certain: Gigi likes places that are accessible to its people in terms of fresh, healthy food, quality transportation, and overall affordability. Gigi, those are three things I can get behind. How many places (cities, towns, etc.) do you estimate you've traveled to since you hit the road full-time? What are your favorite and least favorite places? I don't know, actually! I stopped keeping track of numbers and tend to focus more on the stories/quality of the places I've been. If I had to guess, I'd say we generally move every one to two months, so in six years that's probably around 72 stops - some duplicate as I keep going back to Paris, Ljubljana, and a few other spots. Favorites depend on my mood and what's important to me at the moment. For food, it's Italy and France all the way! For views, it's the Swiss Alps and the Slovenian Alps and the Okavongo Delta in Botswana. When it comes to friendly people, I had an amazing time in Ghent, Belgium. What is your favorite type of community to be in? For me, the smaller and more picturesque, the better! We do travel to cities, but my preference is definitely to be in a small town with a good train connection. What do you believe are the three most important components of a great place? One, natural beauty and the ability to walk out my door and be on a hiking trail quickly; two, the ability to live car-free; three, access to healthy, high-quality, GMO-free, locally-grown food (preferably at big weekly fresh markets!). What's your favorite city experience? My favorite cities are Paris and Ljubljana. Ljubljana because it's so clean and pretty and not nearly as overwhelming as cities normally are. And Paris because it's extremely pretty and has some of the best food in the world. I will happily put up with a week of city noise in exchange for the opportunity to eat in Parisian restaurants. Why do you enjoy some places more than others, and how would you change this? I'm sure it's a combination of factors - including my love for introvert/quiet time, my high sensitivity to noise, my history of anxiety and OCD, etc. - but I've found over the years that the places I feel best are quiet, natural places where I feel safe and have access to good food. Honestly, I don't want to change it. I don't want to be in big busy chaotic cities anyway, so it's okay that my soul longs for quiet greenery. Too many to list! High up on the visit-for-fun list are Norway (the fjords!) and the Italian Alps. Currently my partner, Chad, and I are looking for a home base in Europe, so we're prioritizing places we think we might want to live. Switzerland, Austria, and Germany are on our radar at the moment. I've been to all three, but need to do a lot more exploring. And just like that, Gigi provided great answers to my questions on great places. Nature, food, and access, Gigi recognizes three qualities good communities of all sizes have that propel them into the stratosphere of amazing places. It's incredibly interesting to understand what draws people like Gigi to certain places in the world, and communities struggling to attract tourists and keep their citizens happy could learn a thing or two from other places. Many thanks to Gigi for taking time out from her journey across the globe to answer these questions, and we wish her many more years of [slow] happy travel!